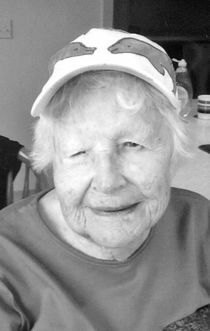 Flora V. Harrison, 96, of Salida died June 11, 2018. She was born Feb. 22, 1922, in Ratcliff, Ark., to Everette McIver and Nellie Mathews McIver. She was the eldest of eight children and grew up in southwestern Kansas during the dust bowl days and in Arkansas. She received a degree as a registered nurse from Kansas University School of Nursing and spent many years in nursing. She met Robert Harrison at Hutchinson Junior College, and the couple married in 1944. They had two children, son David and daughter Tenny. The couple raised their children in Salida. Mrs. Harrison worked at the Denver & Rio Grande Hospital in Salida, then took time out to manage their surveying office. She became the first woman registered land surveyor in the state of Colorado. Although the couple divorced, they remained lifelong friends until his death in 1995. Mrs. Harrison sold the survey office, took a refresher course in nursing and combined that with her love for travel. She lived in 10 towns in 10 years and took nursing positions in nursing homes in most of the places. She returned to Salida while her Salida grandchildren were still in high school. Family and friends said she enjoyed her home across from Alpine Park, was an avid gardener and cultivated many friendships. She was a member of the Salida United Methodist Church. In 2010 she moved to a retirement center in Boulder to be closer to family. In 2014 she returned to Salida to Columbine Manor Care Center. Her family said she made all her own decisions, including when she quit driving, when she sold her home, where she moved for a retirement center, when she’d return to Salida and that she wanted to live in Columbine Manor, where she had also previously been a nurse. Survivors include her son, David (Melinda) Harrison of Boulder; daughter, Tenny (Leonard) Post of Salida; grandsons, Joel (Kristy) Harrison of Hayward, Wis., Jeff (Katy) Post and Lorenzo (Julia) Worster of Nevada City, Calif.; granddaughters, Kirstin Taylor of Blackhawk, Torrey (Jason) Lengerich of Salida, and Amelia (Christian) Vargas of Lafayette; sisters Jane (Les) Craig of Harlingen, Texas, and Harriett (Gene) Brosius of Seattle, Wash.; brother Douglas McIver of St. Johnsville, N.Y.; and sisters-in-law Lona McIver of Wichita, Kan., Helen Cox of Hutchinson, Kan., and Jean McIver of Redondo Beach, Calif.
She is also survived by 12 great-grandchildren, Emma Post, Ally Post, Lily Lengerich and Cedar Lengerich of Salida, Aksel Taylor, MicaLee Taylor, Lauren Harrison, Reese Harrison, Antuan Vargas, Jerome Vargas, Sage Worster and Aurora Worster.